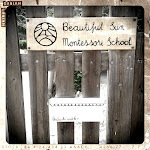 Beautiful Sun Montessori: Learning to talk and to listen. Learning to talk and to listen. Loved THIS article from the Atlantic because it reminded me that the most important thing we can be focusing on in the classroom is conversation, to talk and listen to each other, to develop understanding of each other and to build our relationships. My mom had recently sent me a wonderful TED talk about how to have better conversations and it was also exactly about this. Seems that the message is coming in from everywhere at once!